Seasonality, business downturns and economic changes are roadblocks that many vocational companies and owners face, making liquidity a primary concern. While it may be in your mindset to pay outright for equipment when you can, it’s often not always considered sound financial advice. When it comes to vocational equipment, finance solutions can range in complexity, especially when you consider a finance structure that needs to support the truck, body, and additional equipment. With so much vocational financing experience, nobody does more to deliver the right financing solution with all the necessary vocational customer requirements than Daimler Truck Financial. No matter what vocational segment you are in, they provide financing that works for you. 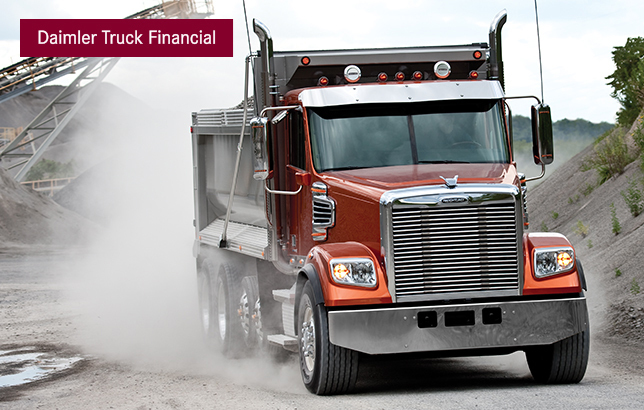 Actual rates, terms, down payment and program eligibility will be determined by Daimler Truck Financial’s Credit Team, based upon creditworthiness of customer.